Visit Montréal’s one and only outdoor zoo! Featuring animal species exclusively from Québec in a cozy and natural setting, the Ecomuseum Zoo provides a unique opportunity to commune with nature just 20 minutes from downtown Montréal. All residents of the Ecomuseum Zoo are there for a special reason: orphaned, injured or born under professional human care, each of them could not return to the wild. Hence, they have found a loving, permanent home at the zoo. Be ready to meet Black Bears, Canada Lynx, Woodland Caribou, Gray Wolves, Eagles, waterfowl and many other ambassadors of Québec’s wildlife. Visit Montréal's Ecomuseum Zoo and enjoy up-close encounters with Québec’s wildlife in a cozy and natural setting. During your outdoor visit, you will meet mammals like the Arctic Fox, the Fisher and the American Porcupine. You will also meet owls, hawks, eagles and immerse yourself in the fascinating world of ducks and waterfowl while visiting the zoo's aviary. Once your outdoor visit is complete, you can visit the indoor “From Light to Dark” exhibit, where you will meet Québec's reptiles, amphibians, fish and small nocturnal mammals. You are more than welcome to stay afterwards and enjoy a coffee or snack in the lunch area. Please note that the zoo does not have a restaurant on-site. The whole visit should take approximately 2 hours. 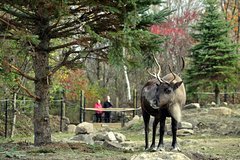 The Ecomuseum Zoo is proud to be a member of Canada's Accredited Zoos and Aquariums (CAZA), an organization that advocates for the welfare of animals and promotes education, conservation and scientific research.